Cooperative Keiji Chiij is teaching others to conserve Guatemala’s cultural textile traditions of growing cotton, natural dyes and weaving. After the seeds are removed the cotton is stretched and pounded into a rectangle in preparation for spinning it into thread. 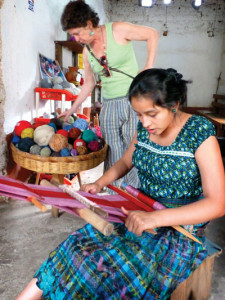 If you are looking for quality handwoven goods that support local weavers, preserve Mayan tradition and are environmentally sustainable, San Juan La Laguna, with its numerous shops boasting natural dyes and superb local woven cotton products, offers an array of unique merchandise. A stand out among the local cooperatives is Keiji Chiij, its shop is located at the end of the short street near the Hotel Maya. 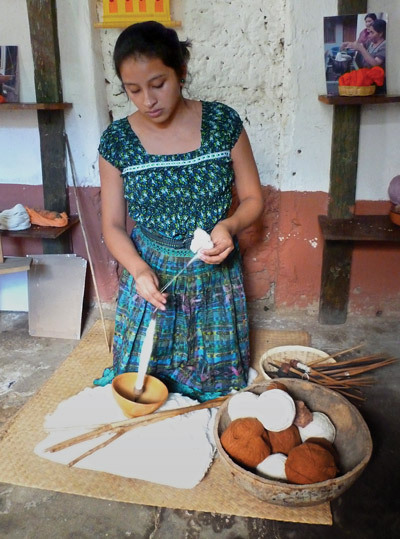 For those interested, cooperative member Delfina demonstrates the art of spinning, winding the cotton on a simple spindle and skillfully creating a thread of consistent thickness which will then be ready for dying. Founded in 1996, Keiji Chiij is the only group that grows its own cotton, once a traditional crop in San Juan. The plants need constant tending, each woman has two or three cotton plants at her house and cultivates additional plants on the mountain. Cotton is one of the most chemical-intensive plants in the world, accounting for 25 percent of global pesticide use. But the collective does not use pesticides and controls, instead marigolds and other herbal deterrents are planted alongside the cotton crop. Once picked, the natural cotton bolls—which are white, khaki or coffee in color—are pulled apart so that the seeds can be removed. The cotton is then stretched and pounded into a rectangle in preparation for spinning it into thread. In contrast, industrial cotton is cleaned and prepared with chemicals, including aldicarb, chlorine and formaldehyde. “One hundred years ago our grandmothers had only four colors in their dyes,” Teresa says, “indigo, cochineal, achiote and plain white. 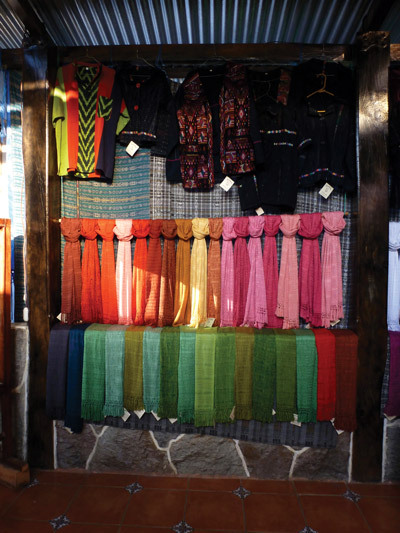 Before the resurgence of interest in natural dyes in San Juan, nearly all cotton was dyed with synthetic colors, which discharged toxic waste into waterways. Keiji Chiij has a comprehensive display of both muted and vivid dye colors and the plants they are derived from, including bougainvillea, guava, carrots, basil and cinnamon. 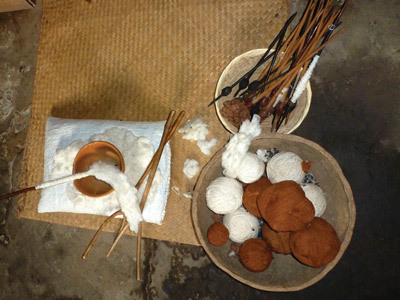 The plant and the cotton are boiled together for about 30 minutes in a large pot of water for the dye. Colors are then made fast by boiling them with the stalk of a banana plant for another 30 minutes. This means that colors will not bleed when worn or washed, a common problem with synthetic dyes. Making and dying the thread are only the first steps in creating a scarf or a poncho. Next is choosing which colors will be used and then tying the threads onto the loom, followed by the actual back strap weaving of the item, a time-consuming process. “Our members work at home,” Teresa says, “so they can care for their families, while also earning money.” Indeed 95 percent of the money from the sale of a product goes to the weaver, with only 5 percent spent maintaining the collective’s shop. Your article was very informative. It is good to know that the traditions are being kept alive. We just arrived back to our Casa after a visit to San Juan today, what a quaint village on the shores of Lake Atitlan. So lovely to see the art of weaving by the local women. Very interesting article, I love how they have increased the colour range by watching nature after a rain storm.